Adam Sablan is a student at San Vicente Elementary. He first volunteered with Beautify CNMI! during our first coconut planting in July. Since then he has come to at least one Beautify CNMI! volunteer event per week. Sometimes he comes to two. He usually brings his mother, Juanita, and sometimes his brother, Zach, and father, Mike, tag along. Adam the Environmental Warrior was featured in a Saipan Tribune article on the same day as our island wide destination enhancement day, 1020 on 10/20. I made him a spear out of tangantangan a week later. I'm sure his mother appreciated it. 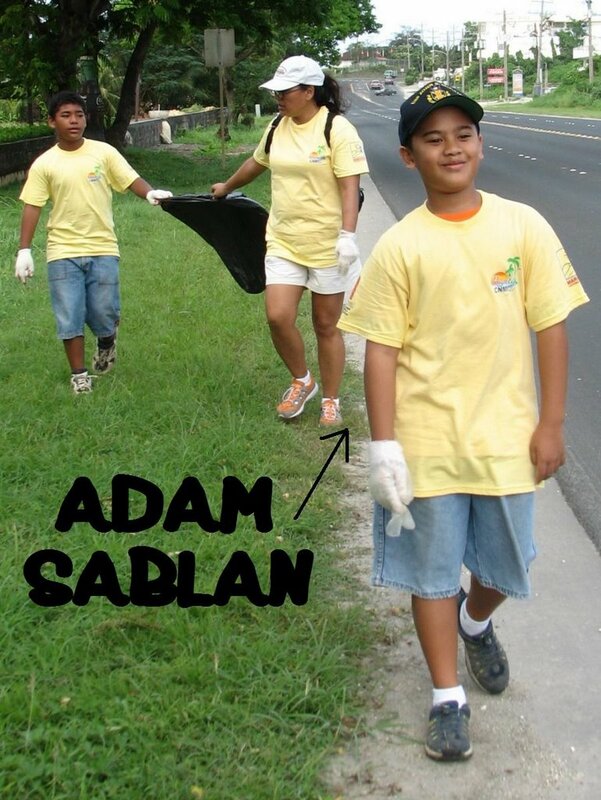 Even though he is only 10, Adam is a role model for anyone who wants to make this island a better place to live and visit. Great job, Adam! Beautify CNMI! doesn't have any activities planned for this weekend, so Adam, enjoy your week off! I'll see you in December! Our first event of the month will be the DEQ Cleanup Brigade cleanup of San Antonio Beach on Saturday, December 2 at 8:00 AM. the young generation is getting involve. yeye! keep it up everyone! && keep our island clean. Way to go, Adam! CONGRATULATIONS! You deserve to be super volunteer this week and every week. Thank you for being such a young inspirational leader to our community and especially to the young generation. Environmental Law would also be a good career choice. LOL! I'm VERY proud of you, my friend! THANKS FOR THE NICE COMMENTS EVERYONE. IT'S ME ADAM!!!. I LOVE SAIPAN. LET'S KEEP IT CLEAN. SEE YOU AT THE NEXT CLEAN UP. BEAUTIFUL CNMI RULEZ! Real Men of Beautify CNMI! CNMI Recycles Day -- Contest results, and thanks! Sunday Morning Activities and New Friends!